Cowpunchers and buckaroos both do the same job and excel at it, they just do it differently. Down In by Don Weller. There has been much debate over the years regarding if cowpunchers are more efficient than buckaroos or vice versa. The truth? Cowpunchers and buckaroos both do the same job and excel at it, they just do it differently. Read below to discover three key differences between cowpunchers and buckaroos. 1) The tack: Buckaroo gear stems from the Spaniards who occupied California centuries ago. Horsemanship was of greatest importance to the Spaniards, and, as such, they took great pride in developing tack that was not only highly efficient, but also provided extra protection for the horses they rode. Fast-forward to the present, and buckaroos are still embracing tradition by using saddles without swells and romal reins. 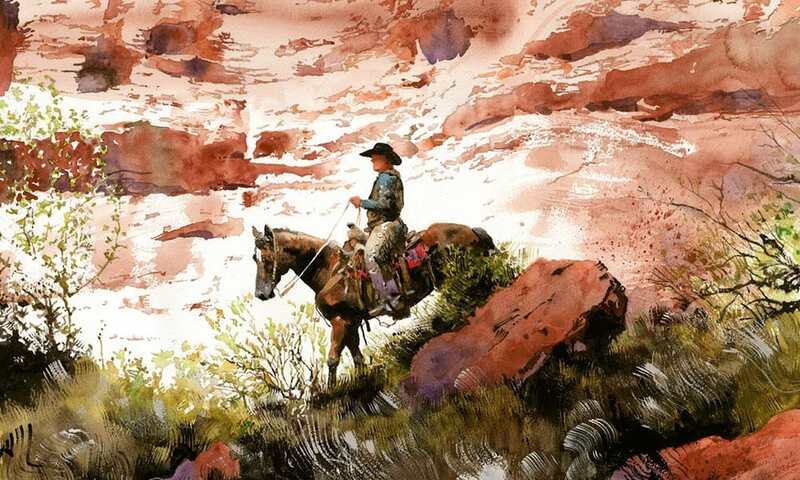 Cowpunchers have certain geographical concerns to consider when choosing tack, such as unpredictable terrain and an abundance of brush, and opt for saddles with swells and split reins. It is also uncommon to see a cowpuncher with tack that is as embellished as the tack that buckaroos sport, a difference that can be attributed to culture. 3) Clothing: A main difference between cowpunchers and buckaroos is that the former wears full-length chaps, batwing or shotgun, when ranching, and the latter wears armitas or chinks. As mentioned above, cowpunchers often ride through harsh terrain which is why they prefer maximum leg protection. 4) Handling livestock: The way that cowpunchers and buckaroos rope and tend to cattle is very different. Cowpunchers use a considerably shorter rope than buckaroos, generally working with a 35 or 40-foot rope vs. the 60-foot rope that a buckaroo is likely to use. This contrast can again be attributed to differences in region. There are other dissimilarities between cowpunchers and buckaroos, but these three help define the variations in lifestyle. It’s important to remember that not every rancher will be 100% cowpuncher or 100% buckaroo. At the end of the day, personal style and horsemanship skills say the most about who you are.